Make My Holiday 2013!! Sign up for our yearly art swap! THIS IS OPEN TO LOCAL, NATIONAL AND INTERNATIONAL ARTISTS! 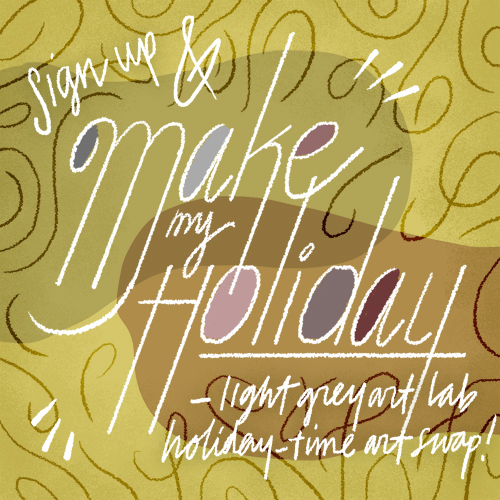 We are happy to announce our second annual MAKE MY HOLIDAY art swap! Would you like to give and receive something really super-special in the mail for the holidays and make a great art friend in the process? Leave a comment with your name and email below before Wednesday November 13th and we'll pair you up another awesome creative person for (what we hope) will be a very memorable gift exchange! Once the call is over Jenny and I will pair people at random and publish a new list by Saturday November 16th! Then, all you have to do is find your person on the list, request their postal-mail address, and make something to send them via postal mail by Friday, December 6th! 2. The thing you send has to be made by you! It doesn't matter when you made it, how you made it, why you made it, or where you made it. Size doesn't matter. Shape doesn't matter. As long as you did it, that's perfect! 4. Please be sure to send your packages out by Friday December 6th so everyone receives their packages before the holidays are over! Here's to the holidays and a happy new year! So spread the word and share that delightful holiday cheer!